The ancient mythology of corn is one that has shaped the Mexican people and it’s influence on Mexican cuisine continues to proliferate. For details of Wahaca Manchester click here. Sustainability, always on the top of our list when opening new restaurants. Something colourful catching your eye as you walk past Wahaca Liverpool Street? Ricardo Cavolo, world renowned Spanish illustrators and muralists, took the restaurant walls as a blank canvas to create a permanent exhibition of his unique style.A graduate in Fine Arts from Salamanca University, he’s an artist with a unique imaginarium and a colourful iconography of tattooed souls, legends and fantastic nature unique to Spain. Ricardo has exhibited in galleries such as Mad is Mad and Espacio Valverde in Madrid, Atomica Gallery (London) and Ó! Galeria (Porto), and has participated in art fairs like JustMadrid. But his turning point came when Cirque Du Soleil chose him to work on one of their artistic projects in Spain in 2010. He has also worked for AIGA (American Institute of Graphic Arts) and on record covers and sleeves for labels like Gran Derby Records and BOA Music. As an illustrator he has published with publishing houses such as SM, Periférica, Lunwerg, Límina (Italy) and Madriguera (Peru). Amongst the books he has published, ‘Cocina Indie’ y ‘Cocina Pop’ together with the journalist Mario Suárez. He has his own graphic novel, ‘El desorganismo de Daniel Johnston’, and also his very own music encyclopedia of ‘100 artists I couldn’t live without’. In 2012 he received the award for best cover from the magazine Yorokobu, and in 2013 and 2014 he was one of the artists invited to the Urban Trends Festival Festival of Madrid, MULAFEST. He has also worked on publicity campaigns for brands such as Nike, Converse, Dockers, Levi’s…, as well as working with Futbol Club Barcelona and has created murals for Urban Outfitters, Cirque du Soleil and Montreal Airport. We have a signed copy of 101 Artists to listen before you die, to be in a chance of winning, simply reply to our instagram video of Ricardo’s work in progress with your name and we will pick a winner on 31st of August. It’s not every day that you get to stack up 8 recycled shipping containers on London’s Southbank and put a restaurant inside them, so we thought we’d make a short film about how we did it and the artists that decorated the space for us. We hope you like it. Additional photography by Oliver Radford. Special thanks to Tristan Manco. We’ve not tried anything like this before. It’s not how restaurants usually get built. But that’s what makes it fun, right? At the beginning of July, we’re going to be opening a new Wahaca perched next to Southbank Centre alongside Waterloo Bridge. This isn’t the kind of opportunity that comes up every day and we wanted to make sure we do this iconic site justice. So this won’t be like a Wahaca restaurant you’ve seen before. To start, we’re not building it from bricks and mortar. Wahaca Southbank will be built from 8 recycled shipping containers, which our architects have designed to fit together on 2 storeys with a cantilevered hanging bar space allowing for 130 hungry people. Our 8 shipping containers have been modified to create a series of interlinked open spaces and include panoramic windows offering some pretty stunning views of the river and the passing parade of people, boats, royalty etc. Wahaca Southbank will be a chance for you to try out some new dishes. Tommi has already been up to her elbows in new recipes specifically for this site following our recent trip to Mexico and LA, and she will also be joined by guest chefs, invited to help develop other new dishes for the Southbank menu. We’re thinking of this as a development kitchen. The dishes that you tell us you like the most will be added to our menu in our other restaurants. We like to think it’ll help us to keep things fresh. We’ve also got a bit more experimental with our decoration. We’ve been working with Tristan Manco, general worldwide authority on all things street art, who’s hooked us up with some amazing artists who will be flying in from Mexico City and around the world to graffiti the space, creating an evolving work of art that will be updated as the mood takes us and the seasons change. What we’ll look like. With a few sketches by graffiti artist Saner. One thing we always like to know when opening a restaurant is how long it’ll be around for. But that’s also a little up in the air. You see, Southbank Centre have invited us to join them as part of this summer’s Festival of the World, a 3 month-long celebration of art instillations and events. They’ve said we can stay for as long as it takes them to decide what to do with the space next, which could be 18 months, or it could be longer. But that’s the clever bit you see. When we do move on, we just pick these shipping containers up, and set them up somewhere else. The Wahaca experiment will move on, opening up for new people, introducing new art and design and new dishes to a new community. So please come and get involved with our experiment. We hope you’ll like the results. On Tuesday 13th September, we’ll be opening up Wahaca number 5 (or 5 and a half if you’re counting the taco van), and taking a taste of Mexican Market Eating to East London’s newest marketplace, Westfield Stratford City, which you’ll find right at the entrance to the Olympic park. Right now, we’re installing all of the state of the art kitchen kit that we need to cook up our delicious Mexican market food and putting the finishing touches to our very funky looking margarita bar which will be serving cocktails, wine, beers and our award winning range of tequilas. There are also some new design elements that we’ve brought to the site so that you can eat in serious style. A table hung from the ceiling anyone? We’re pushing ourselves even further with the sustainability of our restaurant build, monitoring our whole fit out using a BREEAM retail assessment, which means that someone is checking up on how well we do with using recycled and sustainable materials – Don’t miss the cork walls and recycled bottles that we’ve used throughout, which have earned us extra green points. We’re especially excited to have commissioned the skills of one of East London’s most prolific street artist, Pure Evil to bring his own style and some very cool colour to the walls. We we’re looking for something raw and provocative and we thought you might like to have a sneak preview of what he got up to last night. Looking good, we hope you’ll agree. So if you’re in the area and need a bit of a break from the shopping, or a bite after going to the cinema, or are heading over to check out how things are going down at the Olympic site, then come and say hi. You’ll find us at number 6 Chestnut Plaza in Westfield Stratford City, open every day from midday. Exclusive news, we’re opening a new Wahaca. This time it’s on wheels. 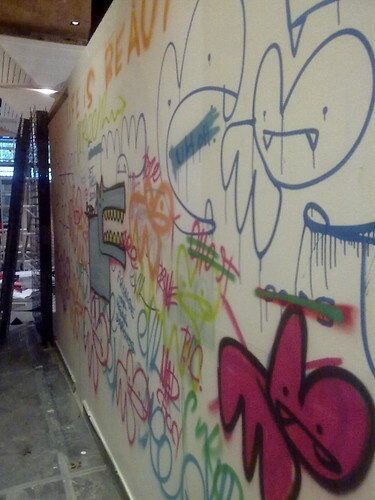 With our new restaurant on Wardour Street in Soho fast approaching completion, one of the last tasks is to get someone to splash a bit of paint on the walls. You know, make it look nice. In fact, local residents and inquisative passers by may have noticed that there’s been quite a bit of that going on, and we’ll give you the full low down on all of the artists that worked on the interior soon. But today, it was the turn of Remi Morgan or Remi/Rough (to those in the know) and we thought he deserved special mention due to his recent involvement in the often whispered about, but until yesterday never reported, Underbelly Project. Thanks to Vandalog for the images via flickr and creative commons. Remi was one of 100 of the worlds top street artists that was invited to take part in a one off art project, deep under the heart of New York City in a dissused and now totally un-accessible subway station. The space was transformed into a exhibition to which only one reporter and a handful of photographers were invited, and which was only on show for one night. Pretty Cool. When we asked him about it in a break from graffiting our bar, Remi mostly recalled the fear of being eaten by mutant sized rats, and the pitch black that perpetuated the space. With this in mind, we’ve left the lights on for him and you’ll be pleased to hear he’s doing a cracking job. We were really excited to be contacted by Tristan Manco, author and general force-for-street-art-good, who let us know about the launch of his new book, Street Sketchbook – Journeys. In the book Tristan explores the secret world of sketchbooks by tracing artists creative journeys, from the initial idea to its development. 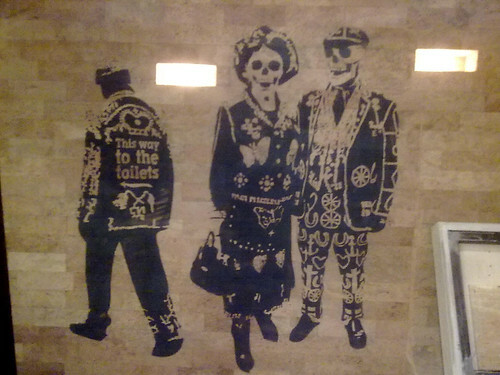 He features work by the most innovative street and graffiti artists from around the world, and unsurprisingly it contains a large proportion of work from the growing number of Mexican artists pushing the boundaries of street art, both in the UK and at home in Mexico. To find out more and see a selection of the work from the artists featured, including Daniel Acosta, Daniel Berman and Uriel Marin, check out the exhibition running at the Pictures on Walls gallery, 46 – 48 Commercial Street, from Friday 1st October 6pm. For full details, check out their events page. If you do go along, we’d love to hear what you think – just leave a comment below. Last summer we ran a competition to find a street artist to graffiti our restaurant. After being blown away by the entries we got, Claroscuro emerged as the winners and have done an amazing job. To see how it all unfolded from a selection of the brilliant entries through to final artwork watch the video below. Thanks to everyone who entered our competition and to everyone who voted as well. We were overwhelmed by both the quantity and fabulous quality of the entries and are looking forward to working with the street art community on other projects in the future.